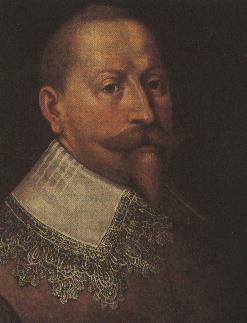 Karl Filip, the kings twenty-year old brother died in 1621 after the victory at Riga. The winter was hard for the swedish army in Livland, todays Lithuania. Disease and famine broke out and there was a shortage of clothing. Of the 14000 men Gutsaf had brought over half perished. Only 5000 remained when spring came 1622. The war continued and soon the swedes had control over the greater part of Livland and the trade on the Duna. The king had personally met with Radziwill to negotiate for peace but these broke down. A cease-fire was signed until summer 1623. After two months of success the king returned to Sweden. His brother in law Johan Kasimir, the Pfalzcount, had come to Sweden with his newborn son Karl Gustaf. Since the king still was childless his sisters son was a possible future king. The son Karl Gustaf will become a person of importance later in swedish and european history. In Europe the religius conflict continued. In Pfalz the catholic armies were victorious and even if the protestant Mansfeldt and Georg Henrik of Baden -Durlach defeated Tilly at Wiesloch by Heidelberg setbacks came to the protestants again. Spanish troops under Cordova united with Tilly and defeated Georg Henrik of Baden-Durlacach at Wimpfen. Soon Mansfeldt was also defeated by Tilly and not much later the third protestant commander Kristian of Braunschweig was beaten by Tilly and Cordova with great losses. The protestants enjoyed some succes in the Netherlands when Mansfeldt retreated there to join with Moritz of Orania and pushed the spaniard Spinola back. These events did not yet effect Sweden. But the escalating conflict promised to bring destruction to Europe in a scale not seen again until the 20th century. Summer of 1623. The swedish army under Gustaf Adolf is again ready to campaign in Livland. With 10000 fresh men he was eager for more success. But the war progressed slowly and with few spectacular victories. A war with Denmark over the fact that the danish demanded taxes from swedish ships in the Öresund strait despite the Kalmar war peace treaty was avoided by negotiating. In 1624 the king was notified of rumors telling that Sigismund was enlisting thousands of german and scottish mercenaries and that a new navy was built in Danzigs harbor. The polish king desired to end the swedish-polish quarrel once and for all by a forcefull offensive against Sweden-Finland while instigating a revolt in Sweden using the exiled swedes from Karl IX reign hat still lived in Poland. The coastal fortresses were refitted in Sweden, troops were repositioned and new soldiers were mustered. The king decided to launch a preemptive move. With twenty ships he sailed to Danzig and blocked the harbor threatening the free city that their lucrative trade would end if they cooperated with Sigismund against Sweden. Spies infiltrated Danzig to find out about the polish preparations for war. It proved that the rumors were false. Soldiers in Sweden were demobilized and some project canselled. The king was free to consentrate on the war in Livland. All winter was spent preparing for a new campaign. The war in Europe progressed to the catholics advantage. In 1624 the majority of northern Germany was in their hands. Gustaf Adolf sugested a north european-swedish alliance were he was to command the united army of 50 000 men. 2/3 of the cost was to be paid by the allied partners and three months in advance. A navy was to be equipped and led by the swedish king. The danish king Kristian IV came with a similar offer that was cheaper and this was appreciated by England and the netherlands and they accepted the danish offer. That the cheaper offer also had less ability was not yet appreciated. This meant that Gustaf Adolf had freedom of action with his new army and he decided to use it to complete the conquest of Livland. In july 1625 a new navy and an army of 12000 men was sent to Livland. In early July Johan Banér reached the town Kokenhusen that surrendered but he fortress did not. Banér put it under siege. On the 13th Gustaf Adolf reached Kokenhusen with his troops and it surrendered on the 15th. The success continued with a string of seized towns and castles. On the 10th of August the chansellor Axel Oxenstierna wrote that the polish did not have much to bragg about left! On the 11th the swedes put the important town of Dorpat under siege by Jakob de la Gardie and Gustav Horn and it surrendered on the 16th after heavy bombardment with heavy casualties. On the 26th Birze surrendered to Svante Banér after a six day siege. Kirrumpä, Marienburg and Neuhausen had also fallen by the 1st of September when de la Barre seized Sesswegen. The polish general Radziwill took the swedish negotiatorsJohan Adler and Arvid Horn prisoners and with 2000 men managed to seize Nerft and Czadosy. 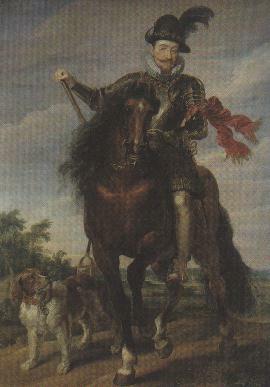 Gustaf himself stormed the castle Bauske on the 17th where the local nobility had gathered their wealth. On the 22nd Anneburg surrendered and on the 24th Mitau. Radziwill could do nothing to stop the swedes rapid movements. By now the swedish army sought winterquarters. Gustav Horn had been wounded. It had been an utterly succesful campaign. That winter the swedes were better prepared and the biggest problem was the enemys cossacks. The unclean angels. The king himself was close to death when his horse was shot under him by a cannonball when reconnoitering Duna. Gosniewskis people was on the other side of the river while Sapieha the older and younger had men firing with musket and gun at the king. In Europe England, the Netherlands and Denmark allied in the evangelic union. Sweden was offered to participate but the king declined since he was busy in Livland. Hurt pride after his offer being rejected possibly influenced the decision as well. To meet them the catholics united in the catholic league. The imperial army was the core led by the ruthless protestant born Albrecht von Wallenstein while the entire league army was led by the experienced catholic fanatic Johann Czercleas Tilly. Both would later face the swedish king on the european battlefields. They had problems cooperating and since the danish king injured himself in a riding accident no major action was fought that year. At christmas 1625 disease broke out in the swedish camps. The king wrote his chansellor that the soldiers died like dogs. He was 31 years old and hadnt seen a set piece battle yet. Only sieges and endless marches. He decided to act like the lightning before his army had decimated itslef by disease. In 36 hours he and 1000 musketeers, 6 guns and 2100 cavalrymen travelled more than 50 km in difficult terrain to the polish at Wallhof that were warned but not totally prepared. On the 7th of january 1626 the battle was fought. The polish had 2525 men of the nobel cavalry. It was the famous and dreaded unit that had destroyed the swedes at Kirkholm 1605 and yet again in 1609. Mounted on large wellbred horse it was considered very superior to the untried swedish-finnish cavalry on their small horses from forests and farms. In addition the polish had 3425 infantrymen and five guns. A very superior force under the commander Johan Stanislaus Sapieha. It was deployed on a ridge in front of the wood where the swedes were expected to emerge in marschformation. But it appeared in battleformation with the infantry in the center and the cavalry at the flanks. The surprised polish tried to redeploy but at that instant Gustaf attacked with his cavalry supported by musketeers and light guns. The dragoons were mainly finnish, the so called "Hakkapällites" after their battlecry "Hakka pälle" which means "strike to the head" but has been translated to "charge". They won magnificently! The polish noble cavalry was scattered and cut down. 1500 polish were killed, 3 guns captured, as well as 150 men with 5 colors and all of their wagon train. Not a single swede was killed but three wounded. The other half of the polish army on their way to Wallhof turned back on hearing of the defeat. It was the first test of Gustaf II Adolf new tactics and army in the field. It was the kings first battle and he had succeded himself. None of his teachers, Jakob de la Gardie or Wrangel, had been there. For the first time the vaunted polish noble cavalry had been driven from the field. It was a huge moral victory for the swedes as well a disastrous loss of prestige for Sigismund. All of Livland became swedish. The victorious king now decided to move the war to the polish Prussia to the southwest were the country was untouched from war and the army could aquire fresh supplies as well as seizing the last polish trade city by the baltic, Danzig, and thus grabbing the polish nation by the throat as Oxenstierna wrote. The conquest of this land would turn the baltic to a sea surrounded by Sweden. A "mare nostrum" in the north. The moving of the campaign also brought the war close to the ongoing war in Europe. "Accidental" involvement became almost inevitable. Perhaps not an unwished possibility by the king?